The most important thing on an overseas self drive trip is of course the car. Being an AA (Automobile Association) club member in Singapore, I was entitled to reciprocal car rental deals with Hertz in Australia. Besides getting a good 10% discount on the rental fees, I was also given a lower excess rate. So, what does a power starved car junky do in a situation like this? Well….get the car I would enjoy driving in the next seven days of course! Booking a car was easy. It was a simple 10 minutes as I browsed through Hertz’s website to book the car I wanted. I didn’t want a 7 seater monster. I drive it everyday now. What I really wanted was a lean mean drivin machine, and thats what I got. 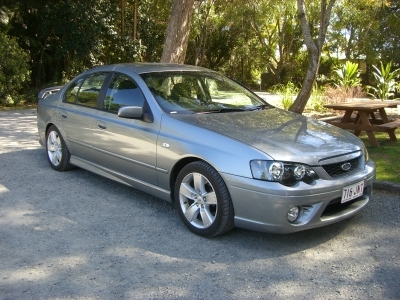 I got for myself, a gleaming silver Ford Falcon XR6 Turbo. Its a 4 litre DOHC Dual Independent VCT Turbo I6 engine! Capable of up to 245kW of power @ 5250rpm and 480Nm of torque @ 2000rpm, and comes with a 6 speed transmission. This baby purrs like a smooth cat when driving, and is shear pleasure to drive. Granted though, I never really got the chance to push this car beyond 110km/h. Believe it or not, I stuck to the road limit fastidously as I had cruise control. I’m proud to say I never got any problem from the police at all. The other thing that this baby came with was a GPS navigator device. I had some problem trying to understand how it worked initially, but once I understood how it worked, it was so easy to use. 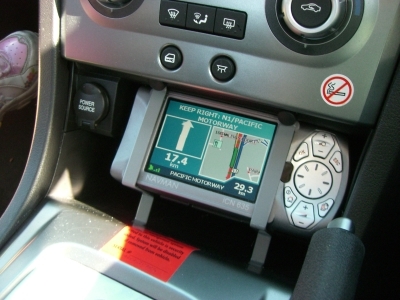 It got us from the airport to Palm Beach without any hitches, and I swear I would get one for my car in Singapore except for the fact that Singapore’s too small to require a GPS navigator. All in all, a very good choice of car. I have absolutely no regrets with this one. In a total of 7 days, and over 700 kilometres clocked, I paid a little over A$130, with mileage utilization at 11.5km/l. Not too bad I think.